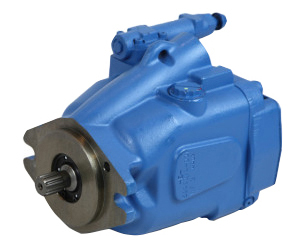 Eaton 420 mobile piston pump are open circuit axial piston designs with displacements of 41cc, 49cc, 62cc, and 80cc for operating speeds up to 2,650 rpm. They are available with a variety of control options to match their performance to a broad range of mobile applications. The highly efficient pump controls reduce cooling system requirements, allowing a smaller and less expensive design to be used. Or, cooling capacity can be kept the same and the flow capability of the system increased to improve performance. 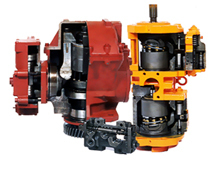 A strong, field-proven rotating group allows the pumps to handle pressures to 280 bar (4000 psi) continuous and 320 bar (4600 psi) intermittent with less maintenance cost. 420 Series ADU pump use a saddle type swash plate with steel-backed polymer bearings and a pressure lubrication passage to reduce wear and support internal loads. The swash plate is very stiff, which reduces deflection and allows even loading of the bearings to extend the unit’s service life. 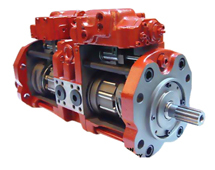 The combination of high load capacity bearings and a stiff drive shaft help provide a pump B10 bearing life of 3320 hours at rated mobile conditions, reducing operating costs and extending operating life. A single control piston is used to vary pump output. 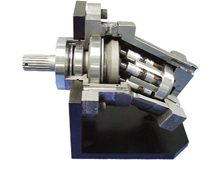 This design reduces the forces acting on the swash plate, resulting in reduced package size, which allows pump installation into tighter locations. In response to customer expectations and regulatory requirements, Eaton has designed the 420 Series piston pump to operate at very low noise levels. A bimetal timing plate is used to improve pump filling characteristics which further reduces fluid-borne noise and extends pump life. Both SAE and ISO mounting flange configurations are available as well as SAE and ISO tube and flange type ports. Side or end ported models are available to facilitate plumbing and help fit the pump to machine space needs, as are multiple drain ports to allow many mounting orientations. The hydraulic piston pump will provide power matching of pump output to system load demand, maximizing efficiency and improving load metering characteristics of any directional control valve installed between the pump and the load. 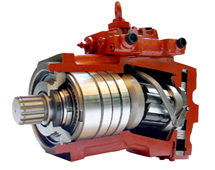 Load sensing ensures that the pump always provides only the amount of flow needed by the load. At the same time, the pump operating pressure adjusts to the actual load pressure plus a pressure differential required for the control action. When the system is not demanding power, the load sense control will operate in an energy saving stand-by mode. Typically, the differential pressure is that between the pressure inlet and service port of a proportionally controlled directional valve, or a load sensing directional control valve. See the model code on page 4 for differential pressure settings for load sensing. If the load pressure exceeds the system pressure setting, the pressure compensator de-strokes the pump. The load sensing line must be as short as possible and can also be used for remote control or unloading of the pump pressure. The pressure compensator uses two springs to cover the full pressure range of the ADU pump. The high pressure spring covers the range from 140 bar (2050 psi) to 280 bar (4060 psi). The low pressure spring is adjustable from minimum pressure through 140 bar (2050 psi). The pump will provide a continuously modulated flow to meet changing load demands at a pre-adjusted compensator pressure. At pressures below the compensator setting, the pump will operate at maximum displacement. The 420 Torque Control limits the power input to the pump preventing the engine from stalling while also optimizing the use of the engine power. When combined with Pressure Compensator Control and/or Load Sense (refer to page 7) it will allow the 420 to remain inside the power envelope of the Pressure Flow curve. When the combination of pump flow and outlet pressure moves outside the envelope the pump displacement will automatically be reduced. The EH Inverse Proportional Pressure control allows for steeples variation of the max pump output pressure, as per the current signal provided to the control valve solenoid. The integrated pump control makes use of an external current signal to vary the pump output pressure. This control has an inverse proportional characteristic i.e. with increasing current signal; the max output pressure is proportionately reduced. Remote relief valve is to be connected to pilot port “J” through necessary external piping. Standard differential pressure of 20 bars is set at RPC spool. The required outlet pressure (below 280 bar) can be set by adjusting remote relief valve setting. Once pressure reaches preset value, flow across remote relief valve starts, this results in RPC spool movement due to pressure imbalance. This will de-stroke the pump to maintain the set pressure. Secondary pressure compensator is provided to limit the max pressure setting as a failsafe measure. The delta pressure is factory set which cannot be changed. The 420 Cold Start Valve reduces pump start-up torque by directing control pressure to the outlet. It is primarily used in cold weather applications and includes a 12 or 24 VDC directional control valve mounted between the pump housing and compensator.